Zentyal is the Linux Small Business Server, it lets you manage all your network services through one single platform. It's a Network Gateway, as well as an Infrastructure, UTM (Unified Threat Manager), Office and Communications Server. All these features are fully integrated and easy to configure, it truly helps to save system administrators time. 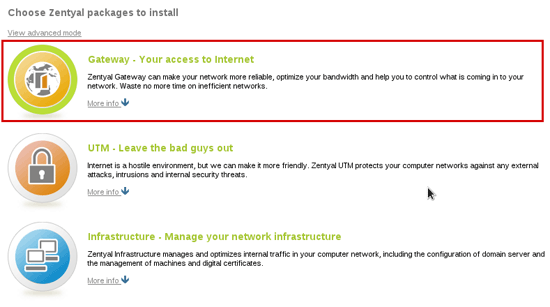 Using Zentyal installer that you can download from the project website. This is the recommended choice, it includes all package dependencies for offline install and also makes some custom configuration. Install on top of a working Ubuntu Server, you can find detailed info and URL for the repository in the Zentyal Installation Guide. If you install Zentyal using the installer you will see this screen when booting from CD-ROM and a couple of wizards will guide you through the process. You can choose default settings in all of them. 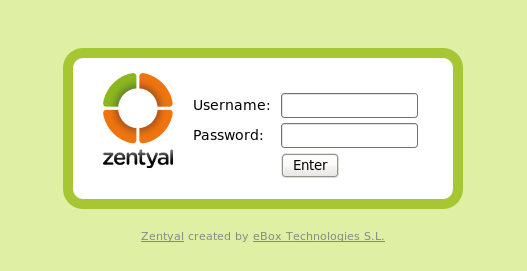 Zentyal provides a web administration interface, after the installation a Firefox browser will show up giving you access to it (you can also access Zentyal from any client browser typing: https://zentyal_server_ip). User and password are the same you entered during installation. Now you can select the desired packages to install, for this tutorial you should install the Gateway package. Later DHCP and DNS modules will also be installed by using the Software Management module. After this step all the necessary packages are installed, now setup will guide you through configuration wizards for installed modules, in this case Network and Users. We can skip network configuration for now, so if you start this tutorial from an already installed Zentyal you can still follow it. Zentyal Server is now installed. By following the next steps you will configure each module. As shown in the scenario, you have to configure three network interfaces, two external routers and one for the internal network. Zentyal will balance traffic between the two Internet connections. Go to Network -> Interfaces and configure each interface by introducing its IP and netmask. 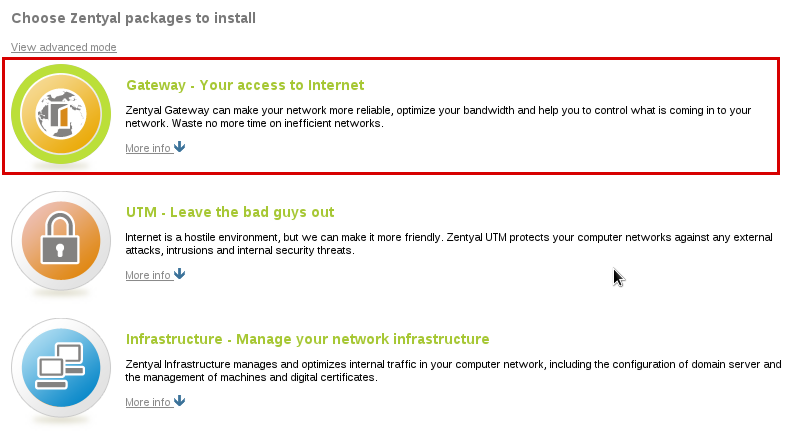 Don't forget to mark external interfaces because Zentyal uses this info in firewall rules. In the next image you can see configuration for one of the external interfaces and the internal one. Go to Network -> Balance Traffic to enable load balancing between the gateways. I am currently working on Zentyal 5.0. The features in 2.0 are not included in the newere versions. There are issues regarding clients joining the Samba domain. There is no groupware rather there is stupid SOGo mail. I am getting issues with my previous version ( I can not install few modules due to broken packages). Rest, its good for small office use.